Speaking at the opening ceremony, Zhenishbek Nogoibaev, the deputy Kyrgyz transport and roads minister, said Kyrgyzstan enjoys close cooperation with Turkish Airlines. The two countries have historical ties and expanding cooperation. 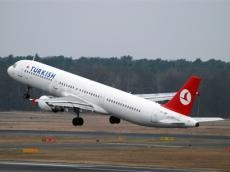 Turkey's Ambassador to Bishkek Cengiz Kamil Firat, who also attended the ceremony, said Turkish Airlines is Turkey’s flag carrier and most valuable brand. He went on to say that Turkish Airlines forms a bridge of friendship between Turkey and Kyrgyzstan. Turkish Airlines started flights to Kyrgyzstan in 1996, and it now offers service 17 times a week. Turkish Airlines, founded in 1933 with a fleet of five aircraft, currently has more than 330 aircraft, including passenger and cargo planes.It flies to 306 destinations in 124 countries.